Speckled with oniony nigella seeds, this gluten-free flatbread is great with dips such as hummus and taramasalata or to wrap falafel or kebab. A handy recipe to have in your repertoire. Mix the psyllium powder with 300ml/10fl oz water. Set aside to allow the mixture to thicken. Tip the flour and nigella seeds into a mixing bowl. Add the sugar and salt to one side of the bowl and the yeast to the other. Crack the eggs into the centre of the flour, add the vinegar, olive oil and the psyllium mixture. Combine the ingredients to form a soft dough. Gradually add about 300ml/10fl oz water - you may not need it all, although the dough should be soft and slightly sticky. Place onto a floured surface and knead to form a smooth dough. Place back in the bowl, cover and leave to rest for 1½ hours, or until doubled in size. Heat the oven to 220C/200C Fan/Gas 9 and place 3 heavy baking trays in the oven to heat up. Dust your work surface with flour. Divide the dough into 12 equal pieces and shape each one into a ball. Roll or press the pieces into oval shapes about 4mm thick. Remove the baking tray from the oven and dust with a little flour. 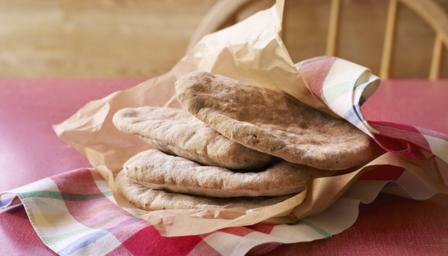 Lay four pittas on each tray and bake for 10-12 minutes, or until puffed up and cooked through. The pittas should have a slight colour to them. Remove from the oven and wrap in a clean tea towel - this helps keeps them soft.